Now you can fill that empty corner in your garden with the stylish Solway. 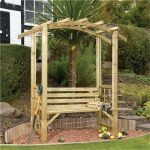 This arbour is constructed from pressure treated softwood so it will stand up against rot and decay. This is a gorgeous slatted building with a very stylish and somewhat unique, conical roof. Comfortable enough for 2 or 3 people to relax and enjoy a glass of bubbly it’s the perfect place for some time out from the outside world with a book, magazine or just to relax and enjoy five minutes peace from the kids or grandkids. This product comes home delivered and includes and installation service. This is one very solid arbour that you are going to be able to enjoy for many, many years. It has been carefully and cleverly crafted using top of the line and strong pressure treated softwood to ensure this has a very robust feel. These lovely looking vertical planks have been used for the wall which look fantastic and would even allow you to have climbing flowers decorate them. A thick and impressively made framing surrounds the structure, which despite its strong design has a very attractive look. A solid seating area will fit in up to three adults and there is even a little area for you to put your glass of wine and any food you may have. 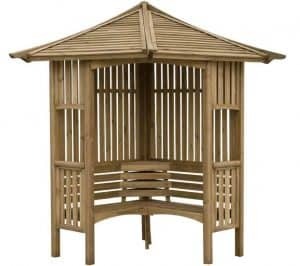 We really love the Blooma Solway Wooden Corner Arbour. It is the perfect way to finish off your garden nicely if you have a barren little space that you have been wondering for ages what to do with it. It also serves as just a flat out awesome place to spend a warm summer’s day watching the kids play in the garden or even when the evenings are warm, you and your other half could sit out here with a glass of wine and relax. This has a very attractive look and the pictures actually make it look far larger than it actually is. However with there is more than enough room for a couple of people to sit inside here. The width and depth are around 5 feet 7 inches and the height is over 8 feet so despite the rather compact design it is still quite spacious when you are sitting inside. This conical style of roof is something that we do not see all that often, but when we do we always really like it. 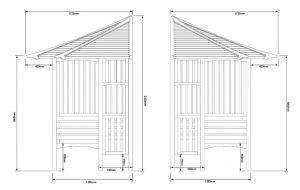 The roof is very well made and has an almost overlap cladding type of style to the panels and a thick framing to keep it all solid. In all we really like what they have done with this roof and it certainly will make it stand out in your garden. 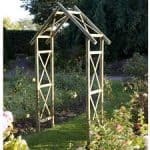 The whole of this arbour is made with some very high quality softwood that has been pressure treated. There are these very stylish vertical softwood panels that make up the walls. These have been cleverly placed so that there is little gaps between each which really does give this an attractive look. These panels are strong and if you do have kids who want to sit in here with you it will be able to take them jumping around like monkeys. You can see from the pictures that there is this very solid frame around the whole structure. This is one very thick and impressive frame that is going to keep this strong for many years. While this is a very robust frame we must say that we also love how it looks and it goes with those vertical panels incredibly well. The framing extends all the way down to the floor and is actually what forms the legs of this structure. Of course there is no actual flooring inside of here, but there is a seating area that is made with thick planks of that pressure treated softwood. At the top of this seating area there is a fantastic and practical little area where you could put food, rest your book or put anything else you need. All of the softwood that is used for this arbour has been pressure treated and that is going to greatly enhance the longevity of this. However you will still want to give it a generous coating of wood treatment to really protect that wood from rot and to make sure it lasts for a long time. We actually would recommend giving this a fresh coating of treatment each year as then you will be really making sure rot and decay keep away. You will get a 10 year guarantee with this, but you will have to treat the wood to make this valid. 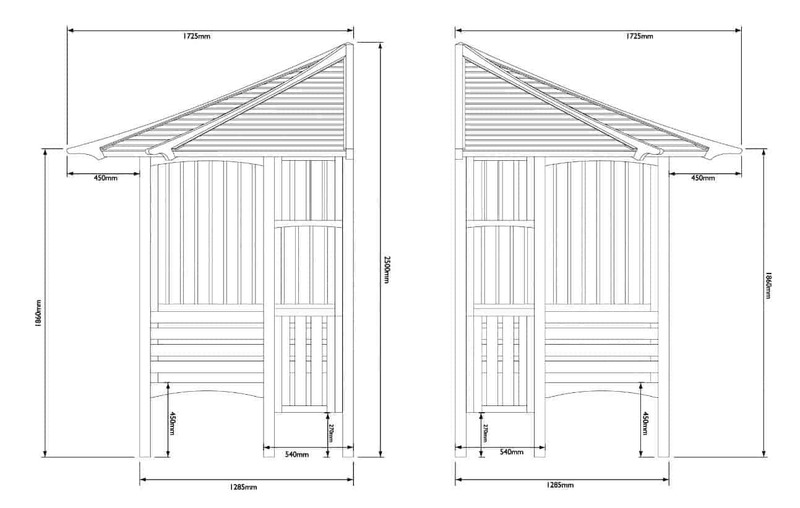 Having a door would defeat the whole purpose of the Blooma Solway Wooden Corner Arbour. But of course there is a good sized opening so you can just come and go as you please. We really like how this looks and it does make this very inviting, it is so inviting that in the morning on a summer’s day you will look out your window, see this and then decide to have your coffee and read the paper in here rather than your kitchen. No actual windows are included with this, but there are two open areas on each side. These could be used to sit your cup of coffee or your glass of wine on. Some people we are sure may be tempted to get some acrylic or even some glass for these open areas, but we actually love the way they look and would leave them as they are. Well with no doors and no windows there is no security here, but to be honest with you, you will not be leaving things in here anyway as it is rather exposed to the elements. 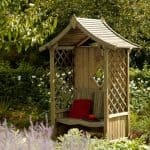 This is quite an open and attractive arbour so we are sure many people are going to take notice of it. The open nature of it means that if you do have kids and want to sneak away for five minutes peace that this is not the place to do it. Still this lack of privacy is not something we are going to slate this for as we love the open nature of it. No customisation options are actually available with this, but you could of course paint it in a colour that goes with the rest of your garden. Or if you do not want to change things up too much you could just use a wood treatment that is clear, but will make the timber a little darker or lighter. No extras are actually offered to you when you buy this, but a couple of things we think you might want to consider are first of all some cushions for the seating area to make it a little more comfortable and also we bet those wall panels would look just amazing with some climbing flowers on them. This is surprisingly thick and sturdy and in general we are very impressed with the way this has been made. With the wood being pressure treated and also with you giving it a generous coating of wood treatment, we can see this lasting you well over 20 years. This does have a compact design and if it is just you and your other half it is perfect, but if you do have friends over regularly then any more than three people in here is not going to work. Still we think the compact design is a huge part of its charm. An installation service is included with this so there is no hitting yourself with a hammer or taking your thumb to A & E in a little cup of ice that you have to worry about. It will take the assemblers around an hour to have this installed so make sure you have the wine chilled and ready. 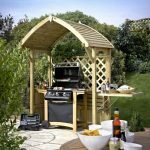 This is the perfect way to really tie your garden together and the price we feel is very reasonable, especially considering it includes installation. 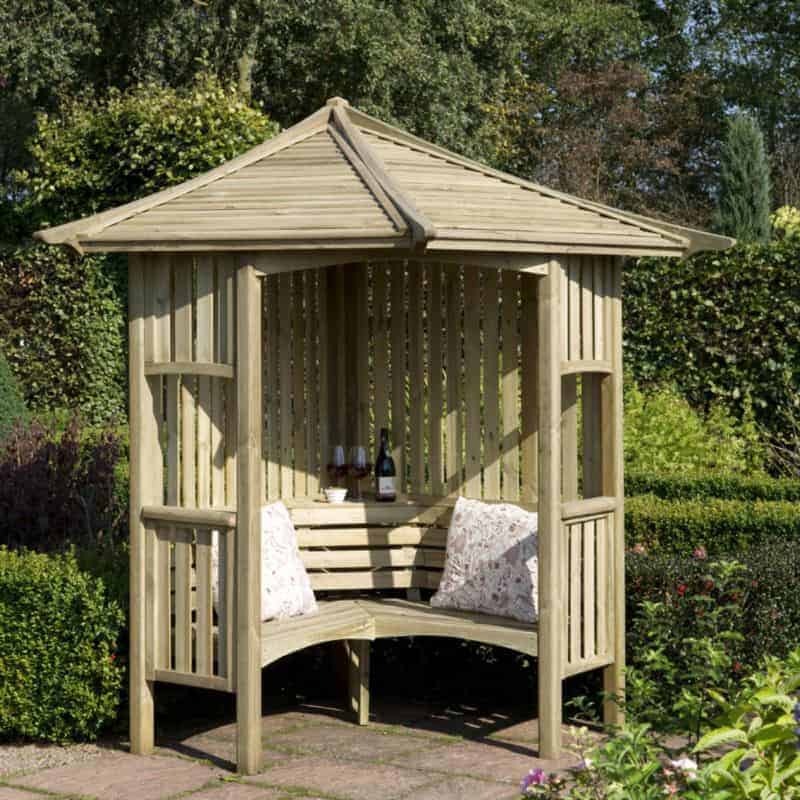 Final Thoughts: The Blooma Solway Wooden Corner Arbour is ideal for those of you who have a little empty space in your garden that you want filled or for those of you who just want a nice place to relax when the weather is good. This really does look fantastic and if you have a knack for gardening you could even decorate this with some climbing flowers. This is made with some very high end materials and the thick nature of it makes it one very strong structure. 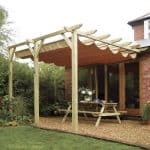 As the price includes installation, we really do feel that this is a great deal and if you have been looking for that last thing to finish of your garden then we highly recommend you give this some serious thought. I had this awkward gap in my garden, and when I read the description of this blooma Solway corner arbour, it said something about the garden, and I took the advice. I am so glad I did because now my garden and backyard is complete. I can sit right in this blooma corner arbour and gaze at the stars at night with my husband and children. This was the best purchase I had ad in such a long time. I love the durability of this as well. I didn’t expect something that wasn’t outrageous in price to be so durable. When I am about to make a purchase, I make sure the product is worth the asking price. I am very cautious with my money. I loved everything about this solway corner arbour. I liked how it was pressure treated. I am into pressure treating wood because I know of the advantages it has on the wood. I don’t spend my money on things I don’t think are high quality. I am all about quality. When I received this arbour, I was not let down at all. I knew this would be something that would last me, and I was right. I have been searching the internet for small corner arbours. It’s hard to find something that fits my exact preference. If I find something small that I don’t like, I won’t purchase the product, or I will return it. 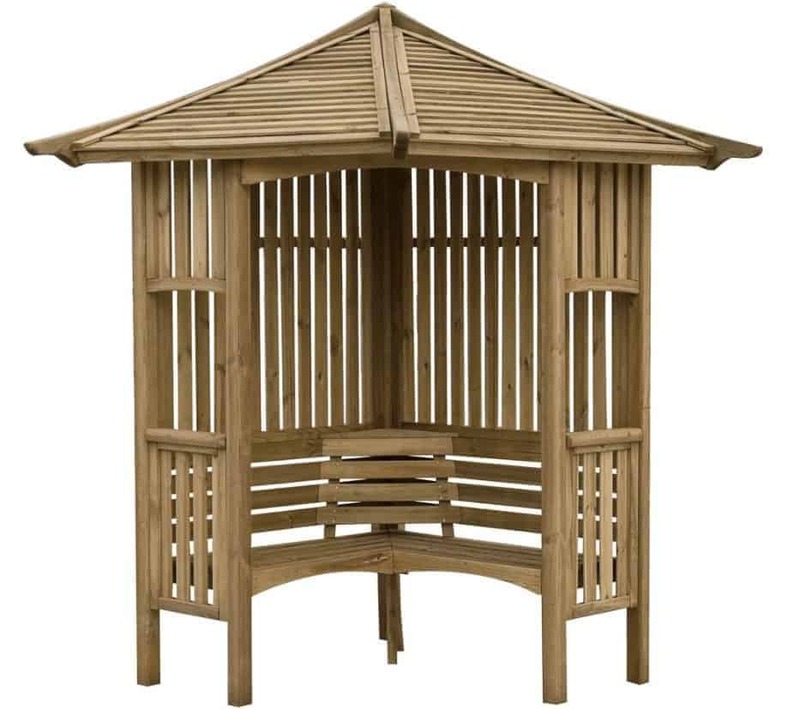 I have to say that this arbour was something I didn’t want to return, and it was a purchase I don’t regret. It fits great in my garden. I don’t think I could have got anything that was more beautiful. My friend had a corner arbour and I fell absolutely in love with it. It looked amazing by 2 trees she has outside her home. Then, she has her pool not far from it. It’s nice to bring my kids over there to go swimming, and my friend and I can catch up. I recently bought this as well. It’s great how my kids can go swimming because I am right there watching them. I don’t have to keep telling them no because I don’t want to go swimming. 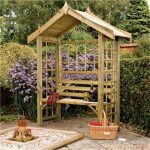 The arbour is sturdy enough for 2 people which is nice. This was a great thing to have so my husband and I could just sit outside and let the kids play. None of us liked staying in the house on a nice day. Even in the fall and if it was cold, we would just bundle up and go outside. As long as it wasn’t freezing, we all wanted to be outside. It is healthy to go outside and get fresh air, so I am glad we have something like this. This was not hard to put together. My husband did it himself. His brother was there at the time but he didn’t even need his help. I usually always need my husband’s help when I put something together. I didn’t even need his help when I put this together. In fact, I did this all before he got home from work. It was his birthday and I wanted to surprise him. He has always wanted one of these. The only thing that I was worried about was that he is so picky so I was unsure if he would like it. He came home, checked it out and said I did a good job picking this out.